Shareholders and bondholders have bought the Tesla growth story. 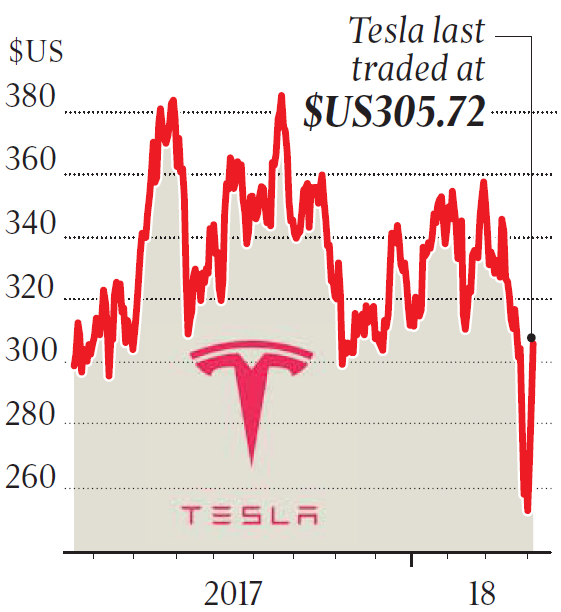 However, my column in The Australian notes that Tesla's significant debt, negative free cashflow and losses loom large. Flagged higher production of the Model 3 hasn't materialised. Where to now for investors? The excitement surrounding the Tesla brand and the energetic can do voice of its chairman and CEO Elon Musk is infectious - so much so, you can almost feel it. Electric cars, autonomous vehicles and EV batteries are the future. The newest and most affordable model from Mr Musk, the Model 3, reportedly has a waitlist of 500,000 supporting the popularity of Tesla’s cars and ongoing growth. Both shareholders and bond investors have bought into the Tesla story. Tesla shares have previously performed very well, trading from around USD41 in 2013 to USD267 on 4 April 2018, but in the first quarter of 2018 they were down a staggering 30 per cent. What went wrong? The poor performance is attributed to two main causes: lower than expected production numbers of the Model 3 and a fatal crash of a so-called driverless vehicle last month, which had the effect of grounding exuberant investors. It is interesting to note that bond investors haven’t had the same rollercoaster ride as the shareholders. Tesla’s most recent bonds were issued last August. It raised USD1.8 billion in a ten year bond issue, paying a paltry 5.3 per cent fixed rate per annum. The bonds were rated a low B- or equivalent and the return offered was almost 3 per cent per annum lower than equivalent rated bonds with shorter terms to maturity. In other words, the Tesla bonds offered an irrationally low return for significant risk. Telsa 2027 bond prices have consistently declined, trading at a discount to USD100 face value from day one. Adding to bond holder pain, last week Moody’s downgraded Tesla bonds to Caa1, citing slower production of the Model 3, maturing convertible debt of USD230 million that would need refinancing in November 2018 and USD920 million in March 2019. What’s more, the bonds sit behind USD1.9 billion (AUD2.5bn) of senior secured debt, which must be repaid before the bonds in a wind up. The lower credit rating should mean it will cost more to issue new bonds in future and increases the risk of default for the 2027 maturity bonds from 32.5 per cent to 50 per cent over the term until maturity. The Standard and Poor’s credit rating is one notch higher at B-. Tesla bond prices reached a low USD87 early this week before the latest Tesla update. Based on this purchase price, yields were higher at 7.6 per cent per annum, if held to maturity, but the return is still below comparable bonds. This week the company released better production figures. While still short of the promised 2,500 Model 3 vehicles per week, total production for all three models for the first quarter of 2018 was up 40 per cent compared to the fourth quarter of 2017. Further, the company stated it would not need to raise additional funding for the rest of the year, allaying investor fears of further raisings. After the announcement, the share price gained 6 per cent while bond prices rose USD2 to USD89. How should investors begin to assess the options? There are headwinds for both share and bonds investors. Revenue, while growing strongly from USD7 billion in 2016 to USD11.7 billion in 2017, has been in lock-step with total debt. No new additional funding is likely to restrict growth, particularly if production continues to fall below expectations. The company is consistently cashflow negative and loss making with huge capital expenditure. Yet at the end of 2017, market capitalisation was USD53 billion. The March 2019 maturing debt whether paid out of existing liquidity or new financing could be a pressure point. Funding from internal sources, will reduce much needed liquidity while external refinancing by issuing new bonds should cost much more than the latest 5.3 per cent per annum bond issue. In 12 months the market will have more data on car production, a key metric to Tesla’s ongoing survivability. If you are a strong believer in the Tesla story, then you are best to stick with the shares. If the dream comes true, the share price has enormous potential. But you should prepare for a rocky road. Shares seem priced for perfection and consistent higher production of the Model 3, so more disappointments will inflict more volatility. The downside is a total wipe-out. More sceptical investors could seek limited comfort in the bonds. The equity cushion of USD48 billion sitting below bondholders would absorb losses. For my money, I’d ignore Tesla completely. Bond investors could consider other more stable, lower risk and shorter term high yield US bonds delivering returns above 8 per cent per annum.